Heat oven to 375°F. Line 9-inch square pan with cooking parchment paper or spray with cooking spray. In large bowl, beat cookie mix, 1/2 cup butter and the egg with electric mixer on medium speed until a soft dough forms. Press dough in bottom of pan. Bake 25 to 30 minutes or until golden brown. Cool completely, about 30 minutes. In medium bowl, beat icing sugar, 1/2 cup butter, the whipping cream and vanilla with electric mixer on medium speed until smooth and creamy. Stir in food colour until well blended. 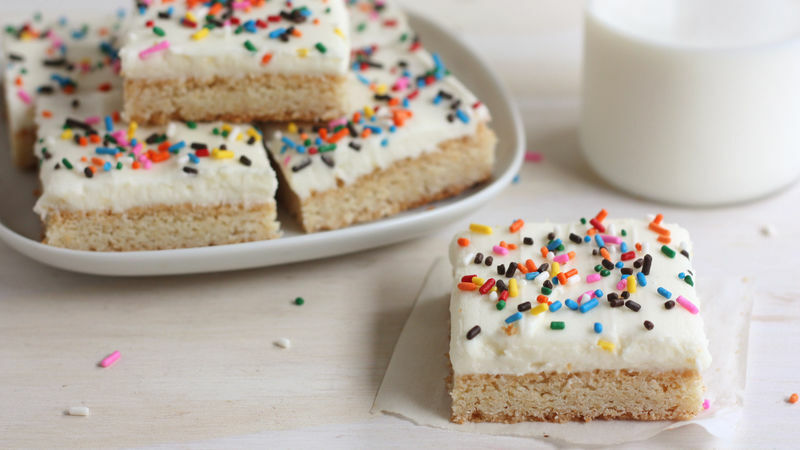 Spread frosting over baked cookie bars. Top with candy sprinkles. Cut into 4 rows by 4 rows. Use the butter wrapper to press the sticky cookie dough into the pan. Use cooking parchment paper with overhanging sides to lift the bars out of the pan for easy frosting and cutting.